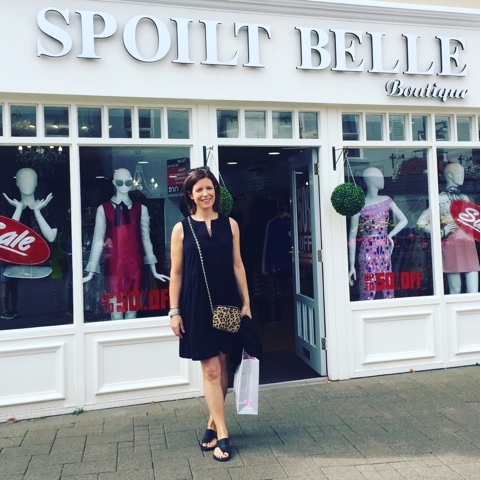 This is so late in the writing and features mostly sale stock - huge apologies about that but I know everyone loves a shopping try-on and I really wanted to share Spoilt Belle Boutique with you - it's a great local NI boutique but it sells online and over the phone so distance is no obstacle if you want to shop here....my kinda retail outlet! 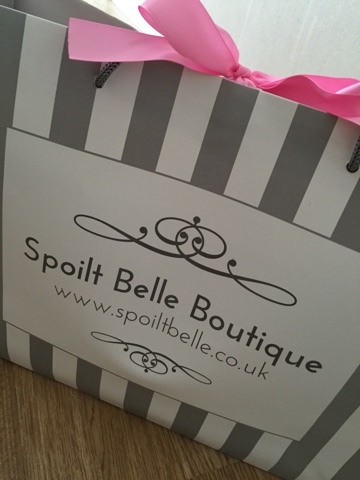 There has been a Spoit Belle Boutique in Magherafelt for years but I didn't have time to call in the last time I was up there so when we were on the north coast on holidays, I took a morning to go see what the Coleraine store is like....and I wasn't disappointed. 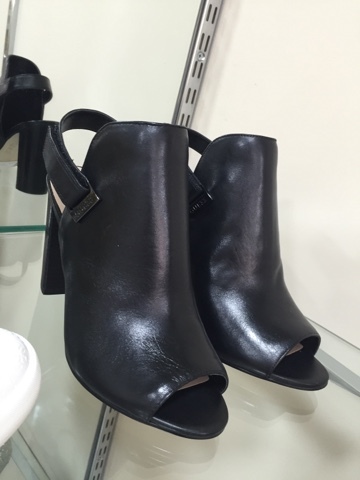 There was so much to try on and so many bargains to be had. 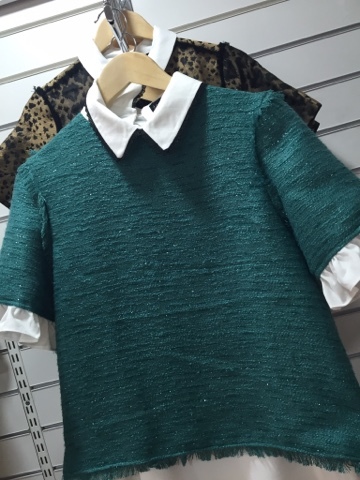 Starting with this jewelled top which was so Ted Baker-esque...with the most gorgeous print and green jewel embellishment. I've had a look online at the SBB website and it's still in stock online on this link, though only in a size 8. . I'm wearing the size 10. Wish I bought it but I have been so bad this past month and needed to stick to the budget. 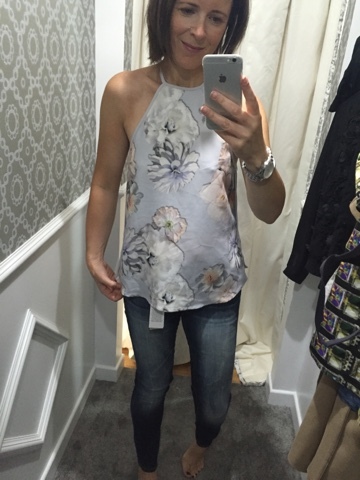 Next up, this cut-away top was right up my street - I love the style and the day to night print but it was a size 12/14 so was too big on top and dangerously revealing side-on...such a shame! 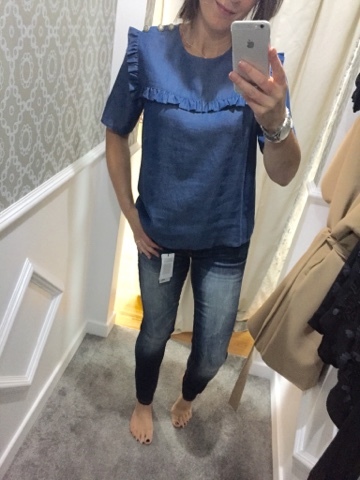 Another lovely top here in a chambray/light denim fabric with gorgeous on-trend frill detail. 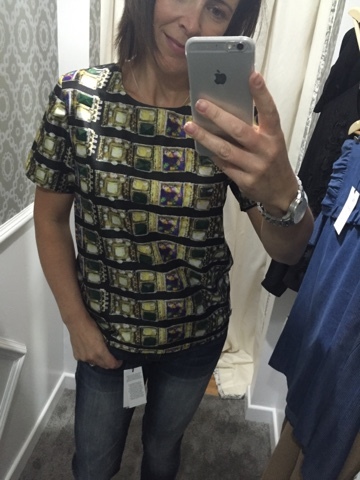 Can you see how I struggled to pick between it all...when I look at this top now, I'm wishing I bought it too!!!! From memory, it was down to about £27. 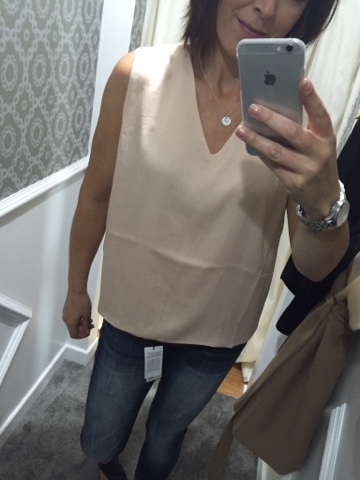 These next two tops were so simple and great wardrobe staples. Sadly both size L and too gapey under my arms...just as well really. But then copped myself on....even I have to admit I'm well covered when it comes to sparkly going-outs shoes and so we reluctantly left the sale footwear behind but I did lust over these Guess shoes that had just arrived as part of the AW stock. I keep seeing SBB styling them with outfits on Instagram...my resistance is crumbling! 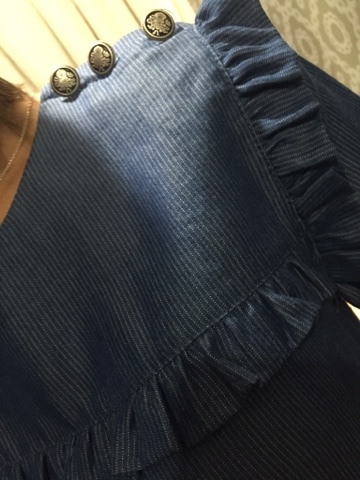 I also loved these layered tops - according to a recent snapchat, the green one is almost totally sold out already! Incidentally, the Coleraine store has had a bit of an update since I was in with some new fittings and and both stores are now full of AW16 stock. I know all this as I'm avidly following them on snapchat and loving the look behind the scenes as well as the snaps of new stock being modelled by the team in both shops. So what did my meagre budget extend to? I managed to get two really practical AW items in the sale - this camel coat/gilet....is there such thing as a cilet? Other than that cleaning stuff?! Anyway, you get the gist...it's something between a coat and a sleeveless gilet and I just adore the colour. 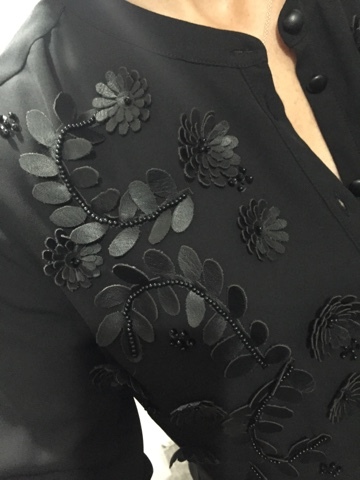 I think it's going to look great over long sleeved knits/polo necks. Can't wait to wear it! 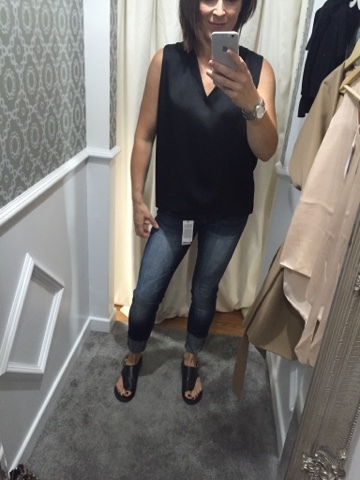 I also bought the jeans I am wearing in all the photos - you've probably seen them lots already. I do like good denim and always try to pick up a pair in the sales. These are by Guess and are called Jeggings but they actually are more like jeans. Both items came to a total of about £65...I didn't look as I keyed the PIN number in....ignorance is bliss. Everything else was left behind....with much regret! But I'm already making a must-have list of the new stock coming in so perhaps it was all for the best. If you're in either town, do pop in for a look...and even if you're not, you can check out their social media accounts on Instagram, Facebook and Snapchat and buy anything you like over the phone and the girls will post it out to you. Good old local customer service - you can't beat it. Disclaimer - this is not a sponsored post and I bought the items myself!